Today I’d like to speak on behalf of the pear. I don’t think that pears get the attention they deserve. The apple, on the other hand, gets all kinds of attention. It’s as American as well, apple pie! Eaten out of hand, baked into cakes, pies, squares, covered with caramel on a stick—I could go on and on. But how about the pear? Raise your hand if you’ve ever made a pear pie. Right! I thought not. 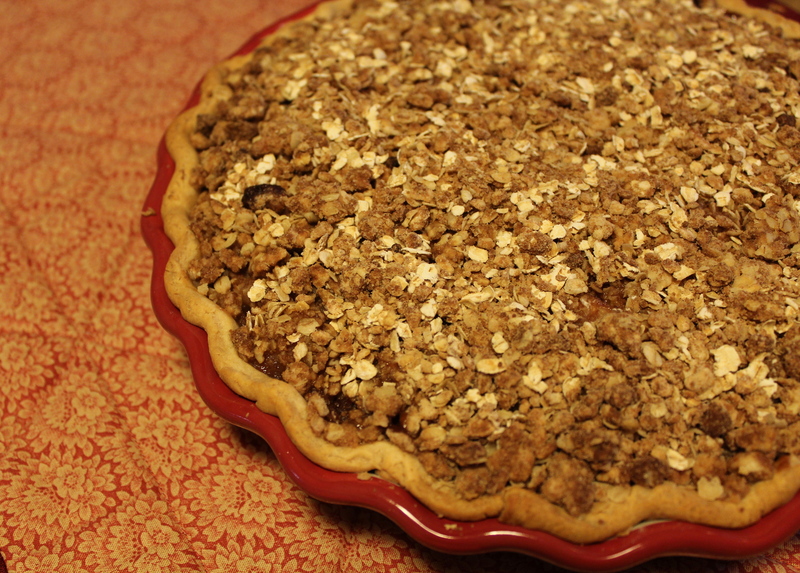 So today I want to introduce you to a wonderful treat–a cranberry pear pie with a streusel crumb topping. 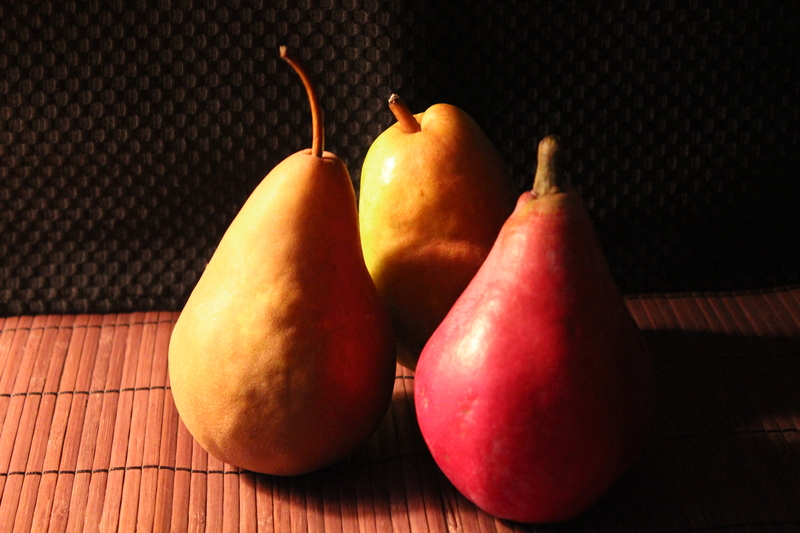 This is the time of year when pears are plentiful and there are many different kinds of pears. The ones we are most familiar with are probably the Bartlett, the Anjou, and the Bosc. Each has its own characteristics, but one thing they all have in common is a juicy sweetness when they are ripe. Most pears are not strong flavored so they pair well with other fruits and seasonings that bring out their flavor, like cranberries, ginger, nutmeg, and orange. This pie incorporates three out of those four. It has fresh cranberries, cooked with orange zest and ginger, which is then mixed with the fresh pears, and piled into a flaky pie crust. 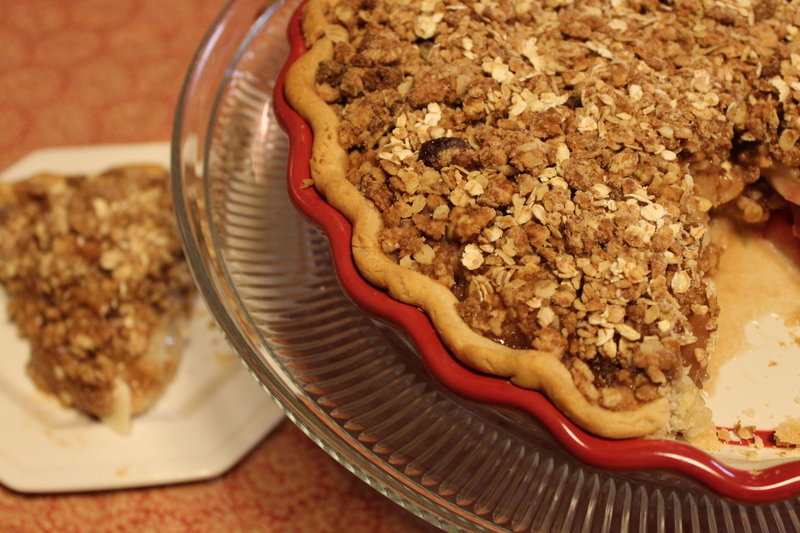 Then it’s topped with a streusel that combines oatmeal with brown sugar, orange juice, more ginger and cinnamon. There’s not much more I can say in praise of this pie except try it and find out how good it is for yourself! 1 ( 1-inch ) piece peeled fresh ginger cut into thin slices. Position oven rack in the lower third of the oven. Preheat oven to 400 degrees. 1. In a small saucepan, combine 1 cup water and 1/3 cup sugar. 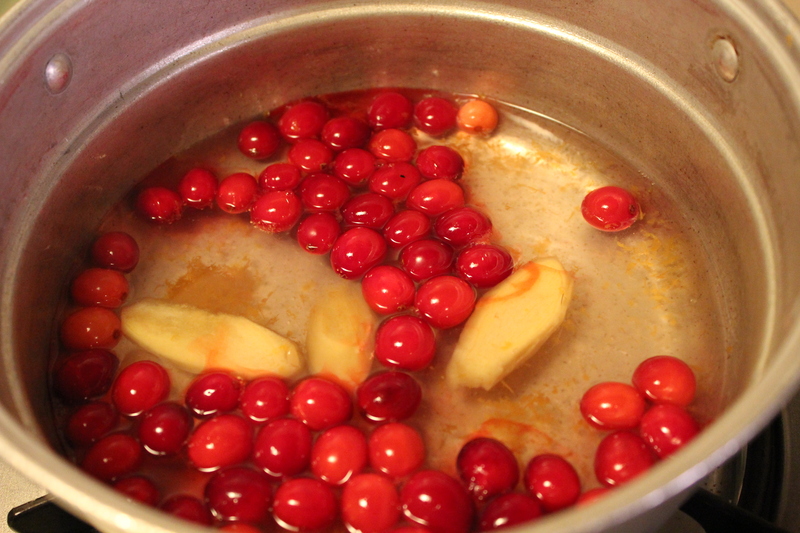 Over medium-high heat, bring to a boil; add cranberries, ginger slices, and orange rind. Return to a boil and stir until sugar dissolves. Reduce heat to low and simmer 15 minutes or until liquid is reduced to 2 tablespoons. Remove from heat. Discard ginger slices. Cool. Cook cranberries with sugar and ginger. 2. Combine lemon juice and sliced pears in a large bowl; toss. Combine 1/4 cup flour and 1/3 cup brown sugar. Add to pears; toss to coat. Stir in cranberry mixture. 3. Fit refrigerated pie crust into a 9-inch pie pan which has been lightly sprayed with cooking spray. Fold edges under; flute. Spoon pear mixture into prepared crust. Pile seasoned pear filling in the pie shell. 1. Melt the butter in a medium bowl in the microwave. Add the orange juice and stir to mix. Measure flour and add along with oats, and remaining ingredients; toss. 2. Sprinkle oat mixture over pear filling. 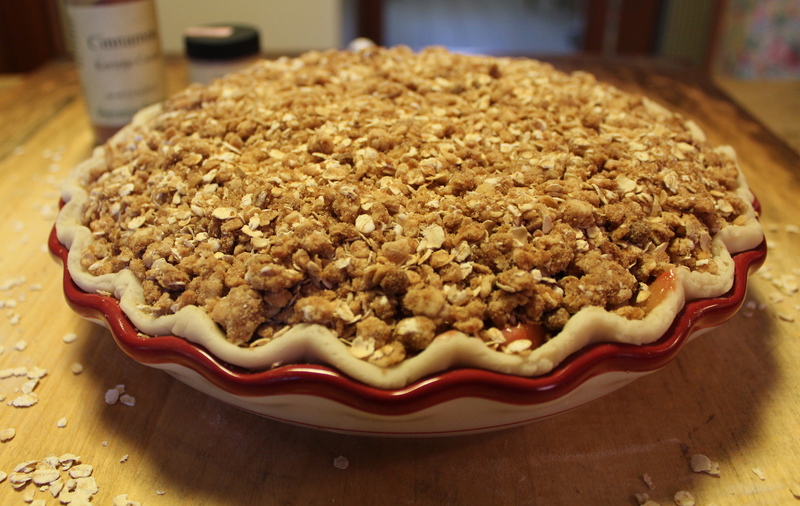 Sprinkle oatmeal crumb topping on pie filling. Cover pie loosely with foil, place on a baking sheet. Bake covered in the lower third of oven at 400 degrees for 1 hour. Uncover; bake another 15 minutes or until nicely browned. Cool on a rack 1 hour before serving. Additional notes: raisins would be a good addition if cranberries are not available. 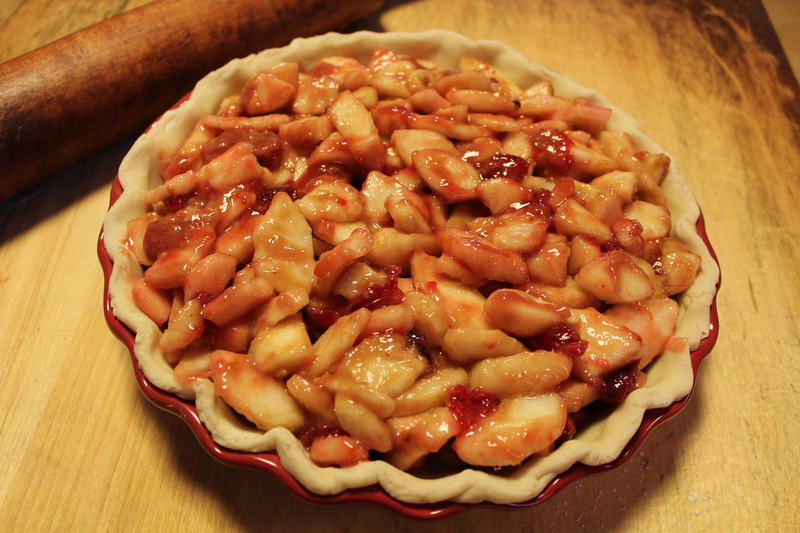 Also you could vary the fruit and use apples instead with equally good ( and tasty) results. Pear and cranberries go exceptionally well together, I agree!